Here are some facts about Captain Scott. Captain Scott was an explorer and officer in the British Royal navy. He led 2 expeditions to the Antarctic and was narrowly beaten to the South Pole by another explorer, Roald Amudsen. Robert Falcon Scott was born in Plymouth in 1868 and became a naval cadet at 13. He was promoted to lieutenant in 1889, spending much of his time overseas. Although Scott was an excellent officer and a good sailor, he did experience some problems. He ran a boat aground in 1893, and his father declared bankruptcy in 1894. 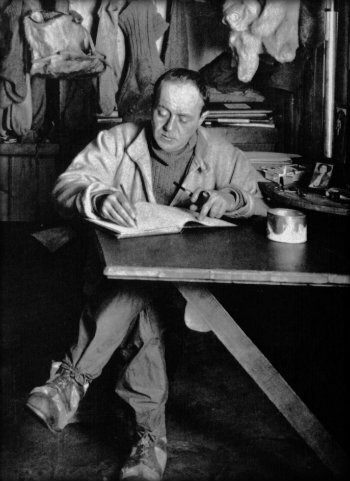 Scott led the National Antarctic Expedition in 1901. Although the team did not reach the South Pole, they made it further south than anyone before them. Scott’s second Antarctic expedition took place in 1910. Soon after landing, the dogs and ponies had to be left behind because of the cold, and only Scott and four other team members continued. Captain Scott reached the South Pole in January, 1911 only to discover a Norwegian explorer, Roald Amundsen had reached there a month earlier. Captain Scott died on 29th March 1912 from the extreme cold on the return journey, within 20 km of supplies. The other team members also perished. Captian Scott left behind his diary (with a final entry on 29th March 1912), letters to family, his former commander and to the public. The bodies of the explorers were discovered in November 1912. They were buried where they died and a cross was erected to mark their final resting place. A memorial service was held at St Paul’s Cathedral and the explorers heroism and determination was celebrated. Earlier in their journey the team spent some time researching Emperor Penguins and collecting their eggs. It was the first time that the flightless bird had been observed with its eggs. Captain Scott and his team also left behind films they took of wildlife in the Antarctic. A fossil from a 250 million old tree was found next to Scott’s body. It helped to prove that the continents were once all joined together and that trees once grew in Antarctica. After his death, Captain Scott became a national hero. Over 30 memorials were built to him in Britain and around the world, and the Scott Polar Research Institute was established. What next? Discover more facts about Antarctica, or learn about other famous explorers – George Mallory, Ernest Shackleton and Edmund Hillary.